During the course of the Urban Friction seminars, we discovered the potential socio-political and cultural repercussions of frictional interventions and engagements in urban life. As the etymology of the word suggests, friction means “rubbing” or “breaking”, which underlines physical connotations. However, in the context of new media technologies amalgamated in the 21st-century cities, physical frictions become less and less visible. Our transportation cards can be read without any physical interaction; we swipe, touch or speak to the screens in order to move around or communicate in public life, we thus simply adopt highly frictionless, yet complex lifestyles. At first, one may think that frictionless and complex sound contradictory, but as we unpack the wider consequences of urban technologies on the level of the society, these two aspects of contemporary cities become rather productive. That is, the fact that technological developments can reduce the physical frictions in our daily lives actually brings out questions about invisible frictions that complicate the publicness of urban life. For example, public spaces are being sterilized through securitization by implementing ever more pervading surveillance technologies. This means that a certain part of the population is marginalized, or pushed away from public spaces. Another way of thinking about invisible frictions is that not everyone is capable of using technological means to participate in this frictionless society. This poses the question how urban technologies can help to bring out multiplicities in public spaces. In this regard, I will explore how these invisible frictions can be turned into political discussions through artistic practices by reflecting on major theoretical framings that were discussed during this seminar series. Taking what Scott McQuire suggests as a starting motivation, “contemporary city is a social experiment whose ends remain uncertain” (1), it becomes possible to adopt a dynamic perspective towards the publicness of today’s cities. As the city is conceptualized as an ‘experiment’, the role of technology as the determinant component is eliminated. In addition, the element of uncertainty encourages a playful approach which renders the social aspect of the city unfinished, or to be constituted in the future. Characterizing the role of digital technologies as posing an ambivalent condition (4), McQuire urges to discover “how we negotiate social encounters, and how we experience relations of proximity and distance, presence and absence” (4). In this regard, Chantal Mouffe’s understanding of public space offers a way, in which artistic practices can enrich the discussions on social encounters in the city. According to Mouffe, the driving force behind any democratic society is contradictions and dissent, which should not be reconciled for the sake of unity (4). Her notion of “agonistic space” as opposed to “public space” therefore will provide a useful tool for analyzing an urban installation project, StalkShow, which also aims to unveil contradictory voices in contemporary society. Furthermore, this art project will also be scrutinized through the lens of curation. Verhoeff and Wilmott take curation as a critical activity when analyzing another urban installation project by the same artist collaboration (Lancel and Maat), Saving Faces. Their criteria for an urban project to be critical will endow Mouffe’s perhaps rather idealistic vision on political art with more practical grounds. Ampatzidou and Molenda claim that “new media give rise to new set of spatial strategies and tactics that can be employed either to increase a centralized technocratic view of the city, or may lead to definition of a new type of public” (109). Thus, considering that artistic practices have the potential to redefine public spaces, Stalkshow will provide a critical lens from which one can understand how politics and curation can be imagined together through urban technologies. Karen Lancel and Hermen Maat have been collaborating on several artistic projects by focusing mainly on themes like privacy, security, trust, and identity in public spaces. They choose to name their urban installations as “meeting places” (lancelmaat.nl), which in a way implies that public spaces themselves do not offer much interaction, therefore need to be improved through these kinds of projects. By creating meeting places, their works aim to operate as “artistic social labs” that can be seen as along the same lines with McQuire’s conceptualization of cities as a “social experiment”. StalkShow (2003-08) is not one of their recent projects that utilizes up-to-date technological means, but it is especially relevant today in terms of the societal issues it tackles, and how it does so. In the words of the artists: “StalkShow is about privacy, control and the alleged threat of social insecurity in our public spaces. It is a response to surveillance systems as a way to ‘eliminate violence’, and to deny violence as a societal emotional signal” (lancelmaat.nl). Considering the ‘terrorist attacks’ that spread over several countries in recent years, public spaces have been infiltrated by the feeling of paranoia and massive securitization regulations. Therefore, StalkShow’s intention to highlight the feeling of insecureness carries strong relevancy in today’s society. The project consists of different technical layers, which all have a shifting role during this artistic/social experiment. 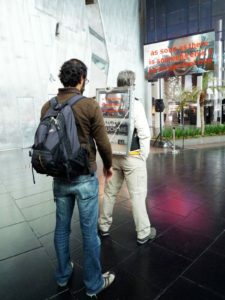 The artists define the arrangement as forming a ‘triangle model’ that includes a wearable billboard screen carried by participants like a backpack, a main urban screen wirelessly connected to this billboard, and people in the public space as viewers. The wearable interactive screen consists of a database, in which a collection of statements about isolation, fear and insecurity appear. These statements were actually collected during Lancel and Maat’s previous project (Agora Phobia), therefore they are based on the actual experiences of people who feel alienated in the society. 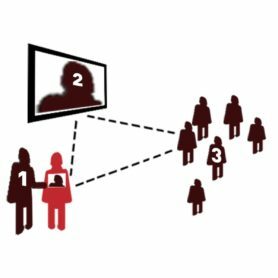 While a participant carries a wearable screen, people are invited to search in this database and at the same time see themselves on the same screen as there is also a webcam recorder mounted on the wearable screen. In addition, the statements they explore are shown simultaneously on the main urban screen with the image of the participant underneath the text. This complex arrangement does not only offer interaction with urban screens, but also creates a connection with ‘invisible’ occupants in the sterilized public spaces, and redefines the relationship with particular sites that host this intervention. Returning to Mouffe, her rejection of the notion ‘public space’, which is built through rational consensus can be seen as a motivation behind StalkShow. Mouffe argues that the public space is based on establishing order, and it is always a political choice in terms of what to include or exclude in this order. This notion works towards creating “a harmonious ensemble” (2), that cannot possibly give voice to every different view. Instead, she advocates an “agonistic model”, in which there is no settlement on how spaces should be constituted (3). Consequently, only the artistic practices that operate by “giving voice to all those who are silenced within the framework of the existing hegemony” can truly be critical (Mouffe 5). In relation to this, Ampatzidou and Molenda also offer a way to see artistic projects in the context of new media technologies as a tool to raise political questions. For them, the use of urban technologies for artistic purposes (what they call ‘artivism’) can put the commercial and military uses of these technologies under scrutiny by highlighting the social aspects of public spaces (111). StalkShow, as an artivist project, attempts to redefine the commercial and military relationships between urban technologies and public spaces by foregrounding the agonistic model. The project was implemented in shopping malls, train stations, airports, and busy squares in different cities around the world. The contradictory usage of technology in these sites, whose specificities are defined through utilizing technology for commercial and surveillance/security purposes, create a friction in urban life. People do not expect to be faced with statements made by unknown others, or their face gazing down the space. In this sense, the site specificity allows StalkShow to stand out as opposed to what is accepted as ordinary for these public spaces. As Pearson and Shanks suggest, “[t]he multiple meanings and readings of performance and site intermingle, amending and compromising one another” (23). In a way, the choice of the site becomes one of the defining elements of the agonistic model exercised by StalkShow. Moreover, beyond giving voice to what is normally not visible in public spaces, StalkShow also achieves criticality through performativity. According to Verhoeff and Wilmott, the practice of curation can be understood as an emerging process, rather than an end product, which takes place while the artistic performance both activates the space and is being activated by others (123). For example, the curation of StalkShow does not come to an end when the artists build the technical ensemble coming out of their vision. In fact, the curation consists of multiple layers here: the textual statements in the database, the person who carries the wearable screen, the person who interacts with that screen, and others who stop by and watch the big urban screen. With each participant who touches the wearable screen, there is a new text-image combination for others to pay attention to. Therefore, the curation is constantly in the process of becoming as a result of this interrelated performance. In a way, as Verhoeff and Wilmott suggests, curation operates through ‘self-reflexivity’(126), which helps StalkShow to question its own potential for creating varying interactions and experimentation. This is how the project gains a critical potential: by creating an agonistic space for different modes of engagements without imposing a unidirectional performance. These various ways of interactions are also encouraged on the level of the interface. The small wearable screen becomes an interface between the person who carries it and who touches it, which creates a social interaction. It also interfaces the person who touches it with the urban screen since this person can see himself simultaneously on two different screens. In addition, the big screen becomes an interface between others in this public space and the person who is in front of the small screen. Consequently, the whole setup interfaces between people who originally made these textual statements (the invisible voices in the database) and all the participants of StalkShow. This way, one can claim that the artistic work creates a model of its own, which can be described as agonistic interfaces. While there are certain ways to interact with urban interfaces in public spaces (commercial or security), StalkShow operates as a friction in this respect by stimulating social connections and political criticality in various layers. There is no end product or a rational voice who reconciles these layers for the sake of unity. The interface (or interfaces the case of StalkShow) becomes what Mouffe describes as a “battleground where different hegemonic projects are confronted” (3). Thus, the exploration of artistic projects that make use of urban technologies through the lens of politics and curation helps to realize frictional potentials in public spaces. It is nevertheless questionable to what extend the agonistic model is feasible since the tendency for perceiving a space as a whole cannot be undermined easily. However, urban interfaces like StalkShow demonstrate the possibility to curate public spaces by including multiple perspectives, especially by foregrounding invisible voices. They also operate in multiple levels while creating interactions on both personal, social and technical levels. While people can identify themselves with the alienated voices in the society, they also relate to the others in that specific site by seeing the face of the other on the screen, or touching the wearable screen on someone else’s back. Hence the versatile nature of the interface, though it is not there permanently, activates a process of critical thinking, in which the urban space indeed becomes a social lab for experimenting. Ampatzidou, Cristina, and Ania Molenda. “New Media in Old Cities: The Emergence of the New Collective.” Delft Architecture Theory Journal 9.1 (2015): 109-122. Chantal Mouffe. “Artistic Activism and Agonistic Spaces.” Art and Research Journal 1.2 (2007). McQuire, Scott. Geomedia, Networked Cities and the Politics of Urban Space. Cambridge: Polity Press, 2016. Pearson, Mike, and Michael Shanks. Theatre/Archeology. Routledge, 2001. Verhoeff, Nanna, and Clancy Wilmott. “Curating the City: Urban Interfaces and Locative Media as Experimental Platforms for Cultural Data.” Rob Kitchin and Sung-Yueh Perng (eds.). Code & The City. London: Routledge, 2016.